When Henry Dunant wrote “A Memory of Solferino” (1862), he could not fancy that only fifty years later the Red Cross would be involved in actions on every continent except Australasia. During our tour through the Old Town of Geneva, you will see, among others, Dunant’s birth place, the former headquarter of the future ICRC, the house in which “A Memory of Solferino” was written and the famous ” Alabama room”. 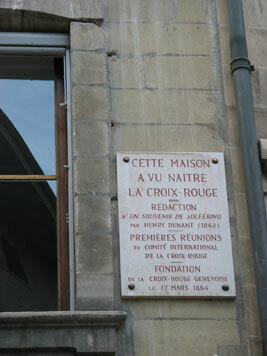 You can pursue the tour with the visit of the International Museum of the Red Cross and the Red Crescent. For further information on this museum, consult www.micr.ch.